While working on D&D, we came up with a modular armor system that we referred to as "gear sets." A gear set is a piece or group of pieces of armor that would be parented to the base skeleton of a character model, then the verts were weighted so the gear pieces would deform properly on the body. A couple other games had done this technique before us, but at the time this was a fairly new technique for creating modularity in character assets. 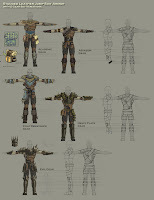 Before this technique, we would just swap out an entire torso for one with armor on it, or the hand meshes with one with built in gauntlets. The sketches that I did here illustrate 5 different gear sets being applied to the same base body mesh. The base mesh and texture does not change, but through gear set swaps, you can quickly get a large variety of looks. I made sure this technique was fully implemented for Titan Quest. Without designing the armor system in this fashion, we would have never been able to pull off the millions of possible armor combinations that we did. Now a days you see this technique being applied to vehicles, buildings, and weapons.